If you’re looking for an easy way to eat healthily, you won’t find one. They all take time in planning, cooking, and prepping. Trust me, I know. Even the Paleo diet can be difficult. But not when you have cookbooks that have Paleo-specific recipes. Some even have weekly meal plans so you don’t have to wonder if you’re following the diet correctly. That can make life a lot easier. 2 What Are The Pros and Cons? Higher consumption of vitamins, minerals, antioxidants, and plant phytochemicals. The PaleoHacks 30-Day Jumpstart: To help you get going immediately! The Eating Paleo at Restaurants Guide: So you can still eat out and have fun! The Paleo Foods and Fails Guide: All the healthiest Paleo foods + shopping lists! The Paleo 4X Cookbook: How the “pros” often eat each day! And The One-Month Paleo Meal Plan: So you always know what to eat! 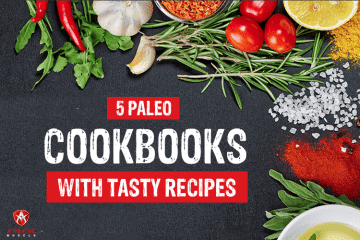 Paleohacks offers the six cookbooks to show that the Paleo diet is not boring or hard to follow if you have the right tools. They include recipes for snacks, meats, soups, salads, omelets, and desserts from more than one Paleo expert. That means the recipes have been tried, tested, and taste-approved. 30 Day Paleo Transformation – a 60-page digital guide to your first 30 days on the Paleo diet. Introduction: Totally transformed: real people, real results. What is the Paleo diet? Why does it work? Paleo on a Budget Guide – a 70-page digital guide that shows you how to make healthy Paleo meals for yourself and your family while saving time and money. This guide is interactive. It comes complete with original videos, audio files, and bonus reading. Paleo Dining Out Guide – a 36-page digital guide that teaches you how to dine out healthfully on a Paleo diet. You can get them separately or all three at a discounted price. This cookbook, written by John Chatham; starts with what the Paleo diet is. It then teaches you how to start on the diet with a chapter on shopping and planning. There’s also a chapter called “Setting Yourself Up for Success”. The focus here is on getting the right mindset and making the transition to Paleo. A 7-day step-by-step plan for beginners, complete with a Paleo shopping guide. 145 Paleo-friendly foods that you can enjoy—and an extensive list of what food items you should avoid. 114 easy, mouthwatering recipes for every meal, such as Eggs Benedict Paleo Style, High-Protein Grain-Free Burgers, Chicken Avocado Wraps, and Paleo Waffles. For those of you that can’t live without your slow cooker. Or if you want to experiment for variety’s sake. This cookbook starts with an overview of the slow cooker and how to choose one. Then it goes into what Paleo is, do’s and don’ts, and what foods are Paleo and what foods aren’t. It contains recipes for entrees, soups, stews, chilies, beef, pork, lamb, chicken, seafood, side dishes, stock, sausages, desserts, and more. Instant access to the cookbook on all your devices. Tips on finding food online, an easy cooking time chart and a guide to good fats. If you can’t eat eggs, nuts or nightshades, the cookbook has 108 autoimmune-friendly recipes. A quick protein/carb/fat breakdown of each recipe to help make sense of what you’re eating. The Paleo diet can be daunting when you don’t know exactly what you’re doing. The cookbooks mentioned in this article all make the process of transitioning to a Paleo diet doable. The meal plans save time because you don’t have to start there. Once you’ve gotten the hang of what foods to shop for and staples to have on hand, you can start experimenting on your own. 121 Paleo Diet Recipes That You Will Love! Should You Consider Going On The Paleo Diet?